Reader’s Digest Condensed Version: I love horses. Always have. Always will. My husband…not so much. But he is wonderfully supportive (hence the reason we have amassed this many I suppose!) and I turn a blind eye when it comes to hockey so all is well. Dressage and warmbloods are my passion. I am a Pony Club “lifer” and teaching kids to ride is so wonderfully rewarding. You can read about my “Official Qualifications” here. Cricket and Tamara back when I was little and cute! I fell in love with horses at a very young age. It was an all consuming, unrequitted love culminating in the desire to spend every waking moment encased in horse hair, caked with manure and braids gnarled with hay and straw. I yearned to scoop poop, pick out hooves, feel steamy breath on my face and brush a scruffy coat til it was slick. My fingertips itched to twine ribbons in long flowing manes and my cheek longed for the soft caress of a velvety nose. I would devour horse magazines, read stories of Black Beauty, Stormy, Misty, memorize all of the lines from “National Velvet” and cover my walls with the centrefolds from “Horse Illustrated”. 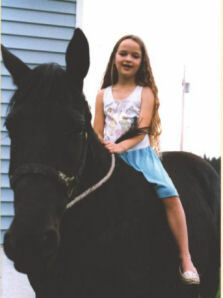 The peak of my obsession was at the age of 11 when I would be known to start sobbing at random moments because I desired a horse so desperately. My mother fondly recalls this common dinner-table-performance to anyone who will listen. My family was never “horsey” so converting them all to the dark side was a very monumental and challenging task. My hopes and dreams were fulfilled at the age of 11 when I was privelaged, nay, blessed to be allowed to take riding lessons from the neighbour. I spent every waking moment indulging my horse obsession, trading babysitting and manual labour in exchange for precious time in the saddle. My neighbour was a former Pony Clubber so my first baby-steps in the equine world were in an English saddle. It immediately felt like “home”. At the age of 12 I discovered the miraculous world of Pony Club. In hindsight it was obviously a club operated by “enablers” designed to capture the hearts of young girls for eternity. A club for horse girls ran by (somewhat older) horse girls. My first night of Pony Club I met a “lifer” named Suzanne. She was passionate about ponies, kids and anything horsey. She immediately took me under her wing and introduced me to the love of my life, Magnum. The moment Magnum stepped off Suzanne’s trailer replays in my mind often. He was only 4 years old, deep, rich, coppery red with a long flowing mane and tail. His large, liquid dark eyes and flared nostrils revealed his Arabian descent while his robust buns and substantial girth bespoke of his Quarter Horse ancestory. He was awe-inspiring and perfect. I was instantly and eternally in love. The spell was broken a mere 15 minutes later when Magnum decided to roll in the freshly harrowed arena with me aboard, but after that tumultuous introduction our relationship was off to a rip-roaring start. Magnum and I were inseperable. I spent most of my childhood with my bony legs wrapped around his belly, exploring the countryside, jumping logs, crossing rivers, chasing pheasants. I pursued every possible aspect of Pony Club with him – jumping, dressage, eventing, Prince Phillip Games. We even dabbled in reining, gymkhana, halter, Western Pleasure but always came back to our beloved English at the end of the day. I was eager to pursue Pony Club testing and advanced through the levels with trusty Magnum. 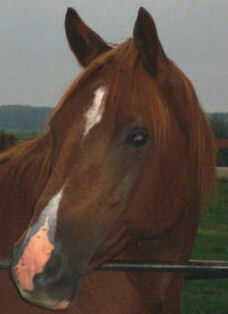 My best human friend was another equally horse crazy girl named Squeaker. It was likely because the only time I would socialize with humans was when they were mounted beside me. We spent every hour we could together – trail riding, taking lessons, gossiping, showing, grooming, building newer-scarier-bigger jumps and having manure fights. Our hijinx were notorious throughout the local horse scene. Pony Club brought out a fiercely competitive/nerd streak in me. I began devouring thick texts on anatomy, physiology, nutrition, conditioning, training, behaviour…you name it. If it had to do with horses, I wanted to know about it. I began competing in Pony Club Quiz, and ended up representing Alberta 3 times at the National level. I was a ferocious competitor in the realm of other nerdy horse girls. To this day I (somewhat successfully) conceal my horse-nerded-ness. Although I must say that the privelage of now teaching Pony Club/corrupting other young girls gives me an outlet to indulge my need to obsess over equines. Magnum and I circa 1995. I love the look of “killer determination” on my face. As a child I trusted Magnum implicitly. Mom recalls a day she came home from work to find me asleep laying backwards astride him with my head on his rump while he carefully grazed his way across the pasture. Youth is a time for fearlessness. Magnum built my confidence and I have seen him do the same for other kids in his later years as well. His honesty over fences and unflappable temperament made me feel on top of the world. The time came when I was able to coerce my family to purchase a few weanlings from a PMU auction. One perfectly timed “OH! DADDY!” as the first foals anxiously trotted into the sale ring had my father bidding with a frantic arm. Buying PMU babies became an annual father-daughter bonding tradition. I discovered a new sense of accomplishment in turning the frightened wild-eyed woolly beasts into civlized equine citzens. To this day I still get “the weanling itch” when the first frost comes. Working with those babies and my Dad in the frosty mornings before school are some of my favourite memories. As Junior High loomed on the horizon we watched as our peers dropped off one by one, trading hoof polish for nail polish, and greasy horse sweat for mascara. My friend Squeaker and I had no use for these girls or the boys they chased. We were content to hang out with boys of the 4 legged variety. Near the end of Grade 11 I smashed myself and my 2 younger brothers up in a spectacular VW Jetta vs pickup truck collision. It isn’t hard to surmise we came out on the losing end of that crash. I ended up with a broken pelvis from the ordeal, an injury that wasn’t discovered until I tried riding and the fracture shifted. It was a hard time in my young life. I had been pushing hard to prepare for a summer of competition and testing for my B Level in Pony Club. Suddenly I was bedridden and weak. Magnum came home from the stable to nurse me back to health with his big dopey lips and quiet calm. Magnum. Man, what a hunk! Before I was able to get “back in the saddle” so to speak, I had graduated from high school and moved away from our cozy ranch in Alberta to attend university in the far-off, mystical land of Saskatchewan. I was very keen to learn everything I could about animals, especially the big 4 leggers I doted upon throughout my childhood. It was a new, scary and overwhelming change for me. The classes were intense, and not knowing a soul in the “big city” was daunting. I was blessed to have my beloved Magnum accompany me. I would go out to the barn for a stress-relieving trail ride or simply bring my textbook with me to read while he ate. Magnum has been the constant in my life. He is home to me. Fast forward several (and several more) years. I graduated from college, got married to my college sweetie, moved back to Alberta, had a houseful of babies (4 boys! ), started a ranch/natural meat business. Life is insanely busy, crazy, and chaotic. I still have Magnum. He is an amazing specimen who looks half his age (he’s now 24). He is sound, sane and beautiful as always. My first true love!! I am so blessed to look out my kitchen window every morning to see him grazing the pastures where we grew up together. He is still home to me. He is now teaching the next generation (my kidlets) and the past generation (my Mom!) how to ride. He is also a favorite with our farm tour visitors offering pony rides to tiny kids and the braver adults. He ONCE gave my husband a ride (it was during the dating phase where a guy will go beyond their comfort zone to impress a girl. Mark is over that now :S). Now that I am “grown up” with babies of my own I’ve slowed down in the kamakaze pilot department. 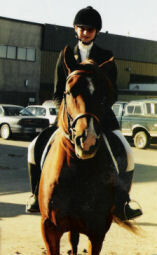 My passion now is dressage instead of the wild and crazy eventing of days past. I enjoy the journey so very much. In the meantime I love-love-love to raise a few doted upon beautiful sport horse/pony foals each year, and continue to teach youngsters how to ride. Yes, I too have become an enabler!! Update: Magnum was suddenly, violently and tragically lost to colic in August 2016 at the age of 26. The colic was severe, he was beyond saving surgically and at his age the odds were not in his favour. He fought hard but in the end it was time for him to rest easy. Our local vet told him he was a good, good boy and euthanized him. The horse that gave me so much heart laid his head with its big droopy lips in my lap once more. I watched the light dim in his eyes as the sun rose. I could see my reflection in his eyes, tears dripping down my chin onto that big velvety face. He truly was a once in a lifetime horse, and one that will never be replaced. I feel extremely blessed to have been a part of his life for 21 years. Some people go a whole lifetime without finding a love like that. Godspeed, Magnum. You are so loved.